I said it last year and I’ll say it again: This past year brought a lot of change and there is more on the way. But rather than a bat year like 2017, 2018 has been a seed year: light, mobile and ready to germinate. The biggest news is that I get to start the LeBoeuf Lab of social fluids at the University of Fribourg in 2019. After a two-year marathon on the academic job market, the Swiss National Science Foundation gave me a go-ahead in the form of a five-year PRIMA grant to start my research group. I’m thrilled, and I’m hiring. The folks in Fribourg have been super in setting things up to welcome me. I am hugely thankful to all of those who supported me in my journey of countless practice talks and myriad application materials. Scientifically, I’ve continued my work with Ofer Feinerman at the Weizmann in Israel. I’ve really enjoyed the creativity of the lab there. My project is moving and developing (as do the ant larvae!). If all goes well, I will share the results with the world in 2019. Speaking of finishing things, I’m pleased as punch that the social JH esterase paper has finally come out. This story was a long time in coming to fruition. There are still many open questions, but these are some answers at long last! Regarding the opening of new scientific doors, last year after a talk, I fortuitously crossed paths with researcher working on hornets, leading to a fun collaboration on hornet social fluids. I also started a writing collaboration about trophallaxis evolution that has been a joy to ponder. Looking to the future, I am putting out my tendrils and looking forward to the many collaborations that will come as I start my group. This year, I’ve had the pleasure to be invited to speak (and consequently travel) to India, the US, France, Austria, Germany, Belgium, Israel, and Switzerland for 12+ conferences, panels and seminars this year. I love speaking and I’m glad I can get others as excited as I am about social fluids and science communication. One of the highlights was the trip to India, involving the trifecta of a great vacation, an excellent scientific visit to NCBS and the opportunity to talk to a passionate audience about the work I do with The Catalyst at the ScienceComm India event. The Catalyst, the science-entertainment association I founded, has had a great 2018. We finally received official non-profit status this year from the canton of Vaud, drop-in improv classes for scientists continue in Lausanne and Geneva, Exposure has spun off from The Catalyst with great success and its own SNSF Agora grant, and CatCave9 continues to provide science-improv laughs on a monthly basis. Regarding Exposure, I’ve continued in the role of scicomm lead as Robbie has taken the lead of the project overall. It has been rewarding to see a project that I care deeply about flourish as I let go of the reins. Socially, Sam and I are doing great and happy to have a touch of vacation time together this winter. We’ve just returned to Geneva from the annual pilgrimage to the redwoods. It has been a great pleasure soaking into Geneva and all of our friendships here this year and I’ll be sad to move away in 2019. While I’m excited about the next chapter of Adria, I’m also sad to close the chapter in Israel. I am especially thankful for the sun, the sea and the excellent friendships I developed during my time there. Looking to 2019, I’m looking forward to germinating! This next period will bring stability and more serious responsibility and I look forward to these new challenges. The LeBoeuf Lab website is live! For your viewing pleasure: LeBoeuf Lab website! On the web, and downloadable versions of my call for PhD students. Join me in unraveling the social circulatory system! 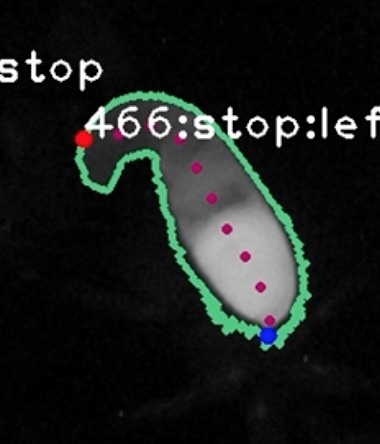 JH Esterase Evolution paper is out! I will joyously be starting my own research group at the University of Fribourg in Switzerland in summer 2019! 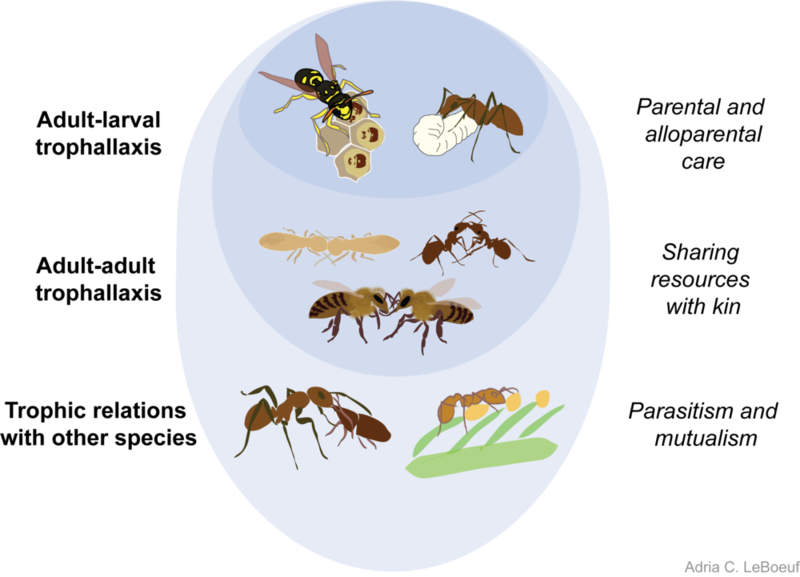 The Laboratory of Social Fluids will focus on the evolution of trophallaxis in social insects and how components passed by trophallaxis with a colony can mediate long-term collective behavior. Field work! Proteomics! Quantitative behavior! The excitement is palpable. Hiring announcements for PhD student positions coming very soon. I made a figure about the myriad forms of trophallaxis and I'm in love with it. Check out my handsome new preprint on the evolution of a family of juvenile hormone esterase-like proteins. We see three features of neofunctionalization: duplications, positive selection and a change in localization. On top of that, when we use a pharmacological inhibitor in vivo in the food and thus trophallactic fluid of nurse-ants rearing larvae, more of those larva survive past adulthood, showing that by regulating these esterases' activity in rearing workers, we can regulate larval development. Great visit to speak at the Biology and Genomics of Social Insects meeting at Cold Spring Harbor (5-8 May) – an excellent meeting. Afterwards I had a great time in my old stomping grounds of NYC. I visited friends and colleagues at Rockefeller (Kronauer group, Hudspeth group) + Princeton (had the pleasure to meet Naomi Leonard: so many common interests!). I even got to drop by caveat.nyc, the awesome science-entertainment venue in the LES. Stellar trip! The year of 2017 brought a lot of change and there is more on the way. It has been a bat year: agile control through instability. Bat flight is an excellent example of a system where instability is necessary for fast adpatation on the wing. My personal life migrated from Lonay to Geneva and my scientific life migrated to the Weizmann in Israel. Consequently I’ve been oscillating throughout the year between these two locations with a handful of additional excursions. My exploration of Israel’s scientific community, landscape, history, warm weather and cats have all been fascinating and enriching. My project in Ofer Feinerman’s group on developmental control in ants is going smoothly and I look forward to getting the story out. Even sooner I hope I’ll be able to share with the world the fascinating tale of my favorite social esterases. Scientifically, I’ve had the pleasure to be invited to speak (and consequently) travel to Japan, Germany, Austria and around Switzerland and Israel for more than ten conferences and seminars this year. I love speaking and I’m glad I can get others as excited as I am about social fluids. While it hasn’t yet manifested into a tenure-track position, I’ve managed to have a handful of interviews, boding well for the future. The Parasite Escape Game at Musée de Zoologie in Lausanne - You are the parasite and the exhibition is the host. Can you escape? These and other science-entertainment activities managed to get me the opportunity to spend some time at the Djerassi Science-Art Residency in California this summer, a wonderful experience I’ll never forget. I met amazing people and began writing a play about machine learning and over- and under-confidence in science and art. I’ve also continued teaching a course I developed on presentation skills in Lausanne at the HEC business school. This course has become more streamlined and gets better every time I teach it (twice this year!). Socially, Sam and I are doing great and happy to be spending time together this winter. I write this from sunny Santa Cruz, sitting outside in the bright winter, looking out over redwoods and squawking guinea fowl. I hope 2018 will bring more stability, happiness, better politics, and more critical thinking and creativity around world. For the 25th anniversary of the Theatre La Grange de Dorigny in Lausanne, I had the opportunity to create a short play about my research in collaboration with Director Benjamin Knobil of companie nonante-trois. We had some great discussions and decided to have a sort of sitcom-vibe to the ants as they discussed deep issues of freedom and social exchange. I wrote the piece in English and Benjamin and the actors managed to translate it into French. It first played in March in Lausanne, and a few months later had a reprise at the Musuem of Natural History in Geneva. Enjoy! Many thanks to Anne Baecher for inviting me to talk about my work on trophallaxis on the Swiss Radio's Science show CQFD (which means QED in French).